Congratulations! You just found a beautiful, new crystals and you love it! Now you’re wondering, “What next?” This post will help you get the most from working with crystals. There are many philosophies and schools of thought when it comes to crystal healing and energy work. I spend a lot of time reading as much as I can from various philosophies. I’ve taken what I like and abandoned the ideas I disagree with. You will want to do this too. It’s okay if you disagree with me on some points. The most important thing, and the thing I want you to take away from reading this post, is that you get to decide what works for you and do that. One thing I know is absolutely true, every time, is that it is more than a good idea to clear your crystals when you first bring them into your home and then regularly as you use them. A crystal that is new to you has had a long journey before it met you. To prevent any negative energy it is holding from affecting you, cleanse it. It’s like washing your hands before eating or starting a to-do list on a fresh sheet of paper: you need a blank slate. So, just get in the habit of clearing every crystal before working with it and especially when it’s new. And by the way, the words “clear” and “cleanse” are often used interchangeably. I will use both. Now, how do you clear them? There are several methods to clear crystals and some are more effective than others, while some are more appropriate for fragile crystals than others. Generally speaking, my favorite way to cleanse crystals when they first arrive is in a bath of lukewarm water with a little sea salt. Salt has the behavior of “pulling out” and “cleansing” energy. Crystals that become brittle, break or even dissolve in water: Selenite, Turquoise, Calcite, Lepidolite, Mica, Pyrite, Labradorite, Malachite and Moldavite. To get the same results as Salt, more safely and gradually, you can place your crystals on a chunk of Selenite overnight. Selenite is very soft, and should be treated with care as it will scratch easily, but storing Selenite among your crystals can also help keep their energy pure and protected when not in use. Carnelian has the property of cleansing other crystals as well, though it may take longer than Selenite. Another tool I have seen people use to cleanse their crystals is sound. Some people work with tuning forks or singing bowls for this, but their are all kinds of videos online that offer differing tones. Crystal singing bowls can also be very effective, if you have one of them. When you’ve cleared your crystals, it is important to dedicate or program them. A clear, but undedicated or un-programmed crystal is like an empty space, waiting to be filled. So if you don’t fill it with Pure Light and Universal Love (in keeping with your spiritual practices and beliefs), or give it a job to do, your crystal can become filled with other energies and may need clearing again sooner than you would like. To dedicate your crystals, hold them in your hand, a few at a time, and picture a pure light surrounding them. Then repeat your dedication of them aloud or in your mind, 3-5 times in a row. Your dedication should embrace who you are, what you believe and the conviction that you only want to use crystals for good, so as to do no harm in your healing or other energy work. Programming crystals works the same way as dedicating them. It’s important to state your program as clear as you can, and again, to repeat it several times in a row while holding your crystal. Related: Why do Crystals Work? 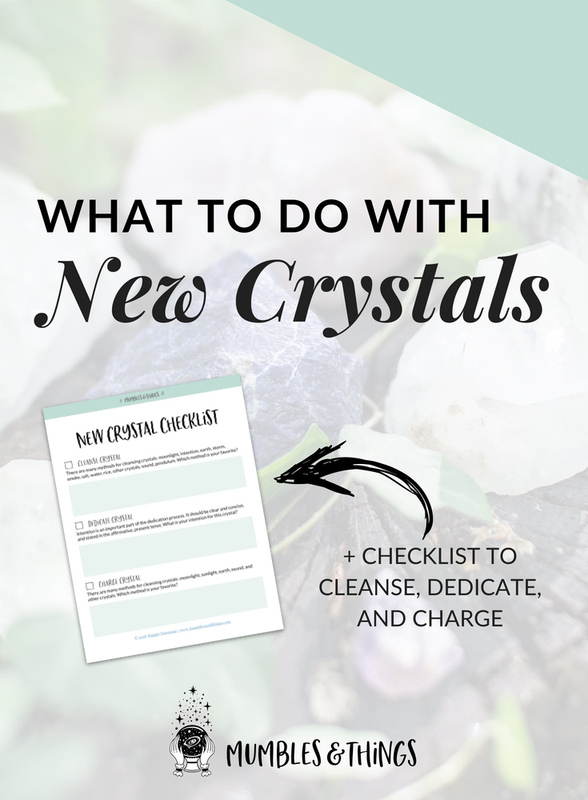 Once you’ve cleansed and dedicated your crystals, you may want to energize or restore their purpose. Moonstone and Amethyst especially benefit from being charged by moonlight, or any crystal that is associated with water element. Choose the phase of the moon for charging based on the intention you have set of the crystal. The Full moon is a good time for all purposes because the energy is at it’s peak. Rhodonite and Rose Quartz love to charge through direct contact with the earth. Crystals that are associated with earth energy can also be charged this way. You can bury the crystal in soil or simply place it so that it touches earth. Some crystals like Clear Quartz, Amethyst, Citrine and Selenite can be used to charge other crystals. Set this intention for the crystal then store with other crystals you’d like to charge. It's like a charging station for crystals! In summary: Clear. Dedicate and/or Program. Charge. Then, enjoy! Ready to get started? Get you free checklist by clicking the button below. You can print the document or save it to your computer. 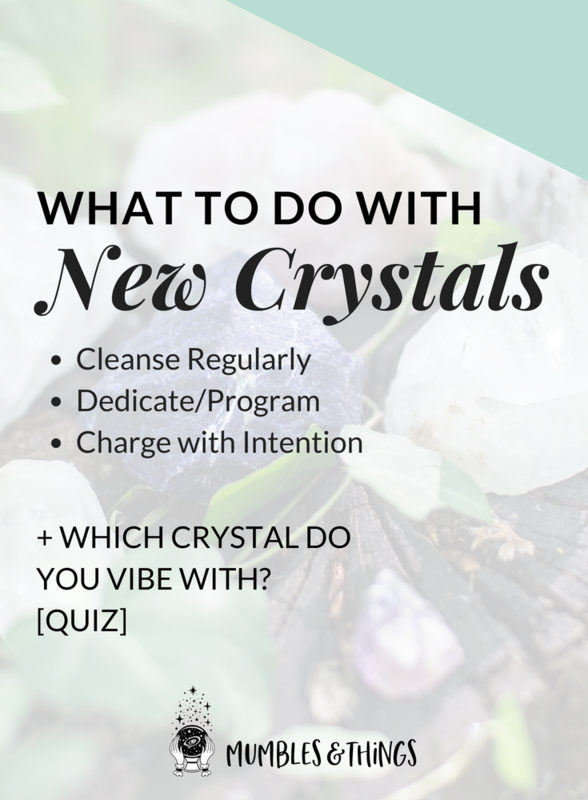 Wondering which crystal you vibe with most? Take the quiz to find out. Share your crystal journey on the Mumbles & Things Facebook page. What do you do with new crystals? Tell me about it in comment below.